Twitter’s promoted tweets cost about $0.55 per click. They’re a budget-friendly solution when you want to build authority and get noticed in a new market or by a prospective client. Target Twitter users using 5 different options. Promoted tweets let you target followers of accounts similar to those of your company’s larger competitors. A popular way of doing that is to use the Interests and Followers filter. Using Interests and Followers targeting doesn’t guarantee directly communicating with a competitor account’s following (only similar followers), but many of the similar companies you’ll find share the same engaged audience. Acumatica promoted a tweet geared toward Intuit Quickbooks customers. As you consider which competitors to target, look at who has the most robust follower count. The second most popular promoted tweet filter is Keywords. Instead of creating a promoted tweet campaign around interests related to your product or service, use keywords based on known customer pain points. For example, if you’re selling enterprise cloud storage to large corporations, it is unlikely that decision makers are tweeting about their interest in IT. Instead, they’re probably asking their followers for a solution to their data needs (e.g., recovery, speed or security). A promoted tweet from Dun & Bradstreet links to their own report as a resource. You can address that potential client with a promoted tweet. Leverage your own content and direct leads to the resources that solve their problem. As you create your list of words to target, include competitor names. Savvy Twitter users sometimes search for company names before following them to gauge the company’s popularity or posting history. 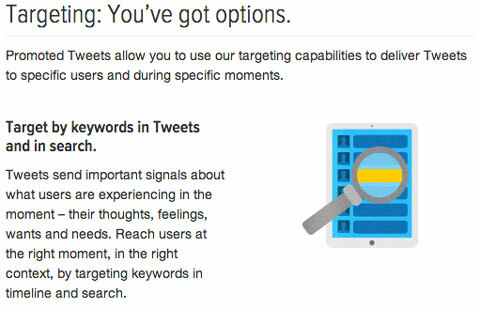 Promoting a tweet or an account to appear in that search puts you at the top of the results for potential clients. With your keyword campaign, you’ve achieved three things: introduced yourself to qualified leads, brought attention to your expertise and established yourself as a resource. LinkedIn sponsored updates top the list as the most expensive paid social media advertising option, costing marketers $4 per click on average. However, as they say, you get what you pay for. Such a high cost comes with additional value, including access to the most audience targeting options of any paid social media marketing platform. With that kind of flexibility, you can now pinpoint extremely specific audiences on LinkedIn. When looking for leads, you want to be noticed by competitors’ long-term clients, right? Obviously you’d like to convert the competition’s customers into your customers. In these cases, you will target your sponsored updates at the clients’ key decision makers. Example of targeting senior-level employees at Social Media Examiner. To find those companies and decision makers, ask your sales department for feedback, use buyer personas and look at data from outbound marketing, then draft a client acquisition wish list with company names to target on LinkedIn. When you have compiled your list, create your sponsored update and base it on two filtering options: Job Function or Seniority and Companies. If your list is fairly uniform (i.e., same industry, same size, etc.) and you have high confidence about which department handles the decision making, use Job Function. If your list is diverse (e.g., varying number of employees and managing departments), it’s best to stick to Seniority targeting only (e.g., Owner, President, Vice President) to avoid mistakenly excluding decision makers. 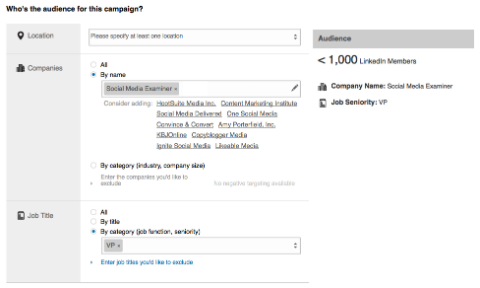 You can also use the Skill keywords option for a LinkedIn sponsored update. It’s useful for targeting individuals who work with specific tools (e.g., software and programs) that match your industry. Skills keywords advertise to individuals who list those skills in their LinkedIn profile. If you pair this filter with other filters such as Seniority and Job Function, the sponsored update reaches decision makers with very specific expertise. While you can include general abilities here, I suggest you stick with specialized skills within a specified audience. If you go with general abilities, you’re more likely to pull in less-than-ideal clients. Reserve general abilities when using the broader Companies filter (e.g., “Graphic Design” vs. “Photoshop”). By targeting specific skill sets, you’re communicating to clients already familiar with your competition, how you compare and how your solutions can fit within their current workflow. Whether your product or service is gender-specific or not, you can gain more attention by crafting a LinkedIn sponsored update that addresses specific business challenges unique to men or women. Your attention to those challenges creates an emotional connection to your brand. Write your sponsored update around hot-button topics in the workplace, such as pay disparity, communication in the office and achieving work/life balance. Federer Performance Management Group picked a topic likely to draw attention to their sponsored update. Use gender-specific targeting wisely. Only share content that is appealing (but not naïve) to your chosen audience to avoid a “female-friendly” steakhouse fiasco. Many marketers who use LinkedIn sponsored updates often overlook the option to exclude targeting categories. Excluding categories allows you to get in front of an even narrower audience and avoid overlap with unwanted audiences. 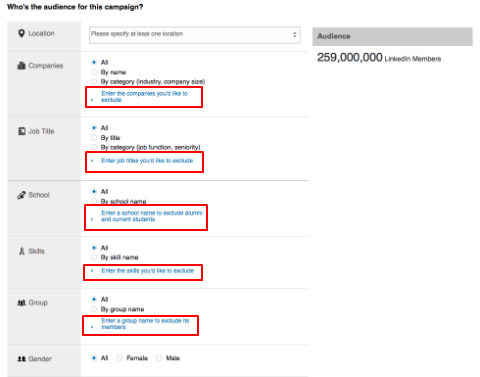 Excluding options within LinkedIn sponsored updates gives you more precise targeting. For instance, when you’re looking for new qualified leads, you don’t need to reach your current clients or competition, so you can exclude keywords related to them. I also suggest excluding job titles related to entry-level or specific C-suite positions. Twitter and LinkedIn are continuously improving their niche targeting methods to complement the complex sales process. Any of the targeting suggestions above offer a new way to promote content— you can also target ads for A/B testing previous campaigns too.